Can you pronounce the name of the berry that is taking the USA by storm. Acai, pronounced ah-sah-EE, is a superfood from the Amazon jungle. We love this stuff. It pumps us fool of great nutrients and doesn't slow us down by having a full stomach. The list of benefits of adding this magic berry to your diet is growing, but here are some the most well known:. 1.Acai’s high Protein levels, which are actually higher than the protein in an Egg, make it an ideal food source for protein in your diet. Usually protein comes with high levels of cholesterol, so simply replacing your morning Egg or Ham with equal weights of fresh Acai pulp is a very effective way to lower your cholesterol and still get enough protein. 2. Acai’s Antioxidant spectrum includes more different Types of Antioxidents than any other known food source. Let’s face it, no single antioxident will allow you to live forever. The hope is now that a regular intake of ALL antioxident types will give your body the best chance to slow or even stop the ageing process. 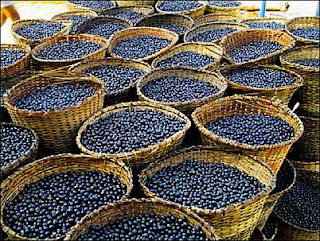 If there is any food likely to prevent serious illness like Cancer, the Acai’s vast antioxidant spectrum is like a big, bright, purple beacon. 3. Specifically, Acai’s Anthocyanins (30 times the amount found in red grapes) are the most efficent way to ingest anthocyanins known to date. If you believe that the French Paradox is caused by Anthocyanins, as most nutritional scientists do, then this is a very important acai benefit to consider. 4. Acai’s mineral Spectrum is also as complete if not more complete than any other single food source. It is probably true that you can’t survive your entire lifetime on any one food source, but Acai comes the closest with traces of every beneficial mineral known to mankind.